Whether you’ve lived in the Puget Sound region your whole life like I have, or you’re new here, there are a plethora of scenic parks waiting to be discovered throughout our region. Having grown up in Seattle and lived in numerous other locales around The Sound, I so appreciate our surrounding beauty, and no matter the weather, I enjoy exploring nature. It’s so important to get “out”, even if it’s raining. Especially in the winter time. Living as far North as we do, the days are short this time of year, and you owe it yourself and your doggies (if you’re a canine owner) to put on your gear and go explore! My beautiful bride, Shawna and I, are parents to three human children and two canine ones. We’ve learned the joys of putting on our hiking boots, rain or shine, and taking our doggies onto the myriad of trails just beyond our back yard. 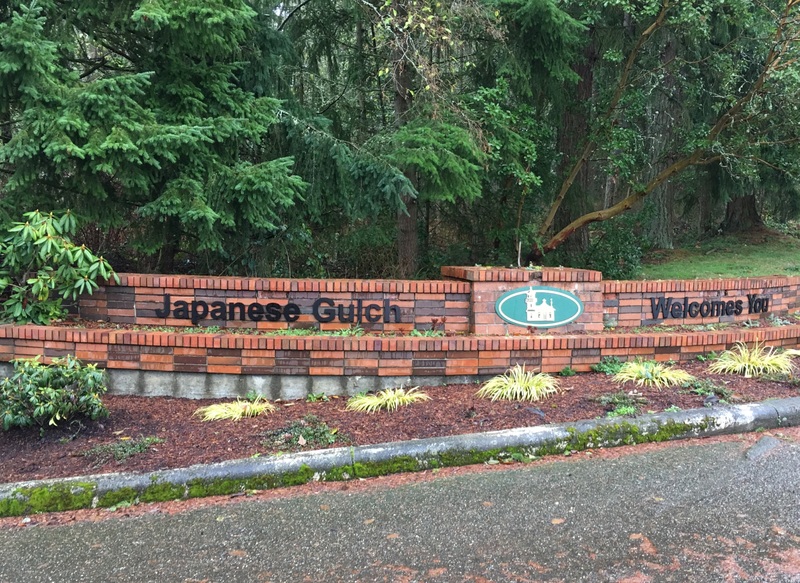 Nestled on Puget Sound 17 miles north of Seattle, Mukilteo (Translated from The Snohomish Dialect, means “narrow passage”) is home to Japanese Gulch. Now I don’t know about you, but gulch isn’t a very attractive sounding word. Wouldn’t it be better if It were called Japanese Forest? Hmmmm, but I digress. Despite the unfortunate name, Japanese Gulch is roughly 145 acres of beautiful wilderness with some of the funnest single track north of Capital Forest. It’s a treasure waiting to be discovered. Just today I was out walking in “The Gulch” with Sockeye, our Siberian Husky, and Pema, our shepherd mix. The three of us were the only ones brave enough to be traipsing around in the rain. It’s so much fun to be walking through this old growth forest, listening to the birds chirping in the distance, the rain dripping from high and low, the sounds of paws and and boots sloshing through the sloppy forest trails. Do yourself a favor, and explore this treasure that is Japanese Gulch. You won’t regret it!